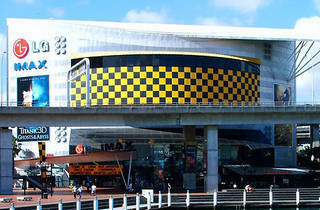 The giant, eye-shaped IMAX theatre lies between a couple major overhanging artillery roads in touristy Darling Harbour. 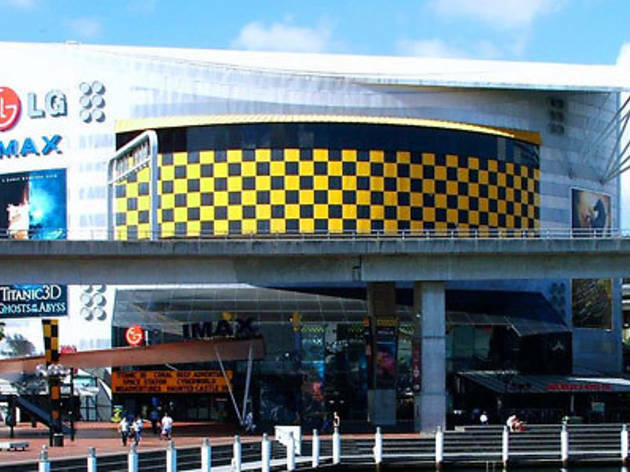 It claims to have the world's largest cinema screen and is one of the only movie theatres to show flicks regularly in 3D. The screen towers at a ridiculous 29.42m (or around eight storeys high) and is 35.73m wide. Its theatre seats a whopping 540 people. An IMAX movie takes your regular 2D film by the balls, slaps it silly and blows it up to gigantic proportions - 10 times larger than traditional cinemas, in fact. It's literarily larger than life. While some films screened at IMAX remain in 2D, others are enhanced by an added dimension. Gone are the days where the 3D experience consisted of sitting in a dark room with some flimsy cardboard glasses precariously perched atop your nose. Nowadays, viewers are kitted out with newfangled polarised glasses. For a film to be 3D, the movie is shot with a special two lens camera and photographed on two separate sets of film. All this snazzy technology transforms what would have been a humdrum experience into something extraordinary. A trip down to IMAX is an economical way to travel through the Grand Canyon, embark on an African safari, swim through the deep blue sea or submerge yourself in the unforgiving underwater world of sharks and whales.